The Venice Biennale (La Biennale di Venezia) has for over a century been one of the most prestigious cultural institutions in the world. Ever since its foundation in 1895, it has been in the avant-garde, promoting new artistic trends and organising international events in contemporary arts. 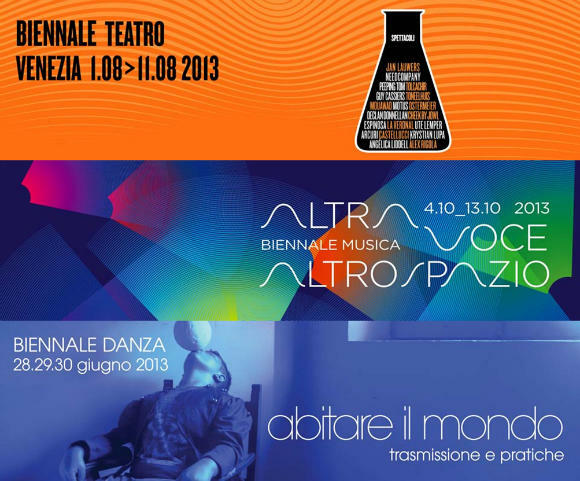 It is world-beating for the International Film Festival, for the International Art Exhibition and for the International Architecture Exhibition, and continues the great tradition of the Festival of Contemporary Music, the Theatre Festival, now flanked by the Festival of Contemporary Dance. In 2013, the Biennale presents the 4th International Kids’ Carnival (2 to 12 February), training and performing activities within the Dance section (2 May to 30 June), the 55th International Art Exhibition (1 June to 24 November), the 42nd International Theatre Festival (1 to 11 August), the 70th Venice International Film Festival (28 August to 7 September), and the 57th International Festival of Contemporary Music (4 to 13 October). New permanent activities run alongside these major events, thanks to the newly available refurbished permanent sites in Venice (Ca’ Giustinian and the Sala delle Colonne for exhibitions and meetings; area for kids; new Biennale Library-ASAC at Giardini for study, research and meetings; Workshops and Educational activities featuring master classes, projects for schools and guided tours; in addition to the Historical Archives of the Biennale at ASAC-VEGA and its collections available for consultation). 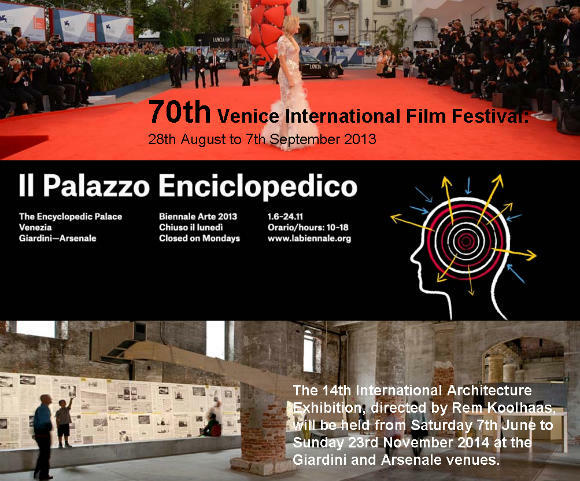 In specific, the 55th International Art Exhibition of la Biennale di Venezia under the artistic direction of Massimiliano Gioni carries the title: "Il Palazzo Enciclopedico / The Encyclopedic Palace". With this choice Massimiliano Gioni is evoking the self-taught Italian-American artist Marino Auriti who on 16 November 1955 filed a design with the US Patent office depicting his Palazzo Enciclopedico. This imaginary museum was meant to house all worldly knowledge, bringing together the greatest discoveries … in a 136-story building that would stand 700 meters tall and take up over 16 blocks in Washington, D.C. "Auriti’s plan was never carried out, of course, but the dream of universal, all-embracing knowledge crops up throughout history, as one that eccentrics like Auriti share with many other artists, writers, scientists, and prophets who have tried—often in vain—to fashion an image of the world that will capture its infinite variety and richness."